It’s an old Viking story: A tall, one-eyed man goes into a bar...well, actually, a Viking great hall...in any case, a place where much beer is consumed. He strides toward the tree the hall was built around, pulls a sword from under his cloak and sticks it deeply into the trunk. This sword, he says—now that he has everyone’s attention—is like no other, but only the man who deserves it will be able to pull it free. No one can, of course, until the hero arrives and pulls the sword as if from its scabbard. It turns out to be capable of cleaving an anvil in half, and eventually his son, the most famous hero in Scandinavian mythology, uses it to kill an equally famous dragon. And, yes, that wasn’t any normal half-blind tree-sticker: It was Odin, ruler of the gods. There’s a theme in that tale: Warriors have always dreamed and told stories about magical weapons—swords that shatter other swords, guns that shoot farther and straighter, fighter planes that are invisible to their opponents and outmaneuver them. The only thing that has changed much is that we no longer just tell stories about such things; we very actively pursue technology to make such things. 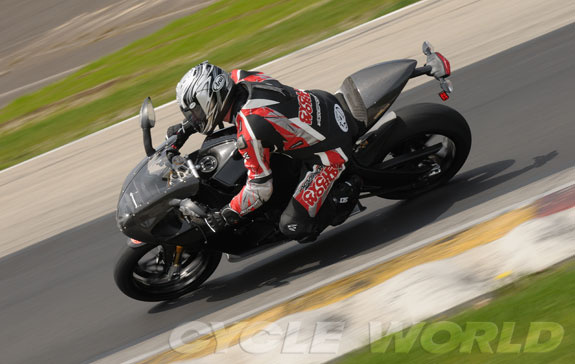 Which brings us to a new bit of magical technology: Erik Buell’s EBR 1190RS. 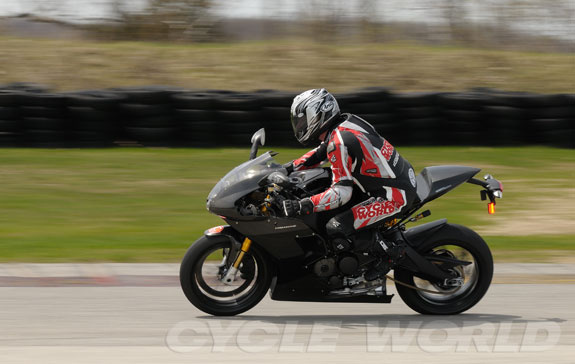 After riding it for about 50 laps at Road America, during a test session that had originally been intended for EBR racer Geoff May alone, I was almost speechless. 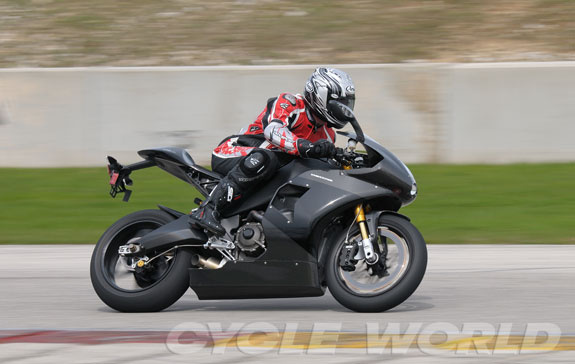 But May, who was trying the street machine for the first time, wasn’t: “This thing is too good to be a streetbike,” he said as he pulled his helmet off after his first laps on an EBR 1190 with a headlight, turnsignals and taillight. “It’s faster than my 1125RR. 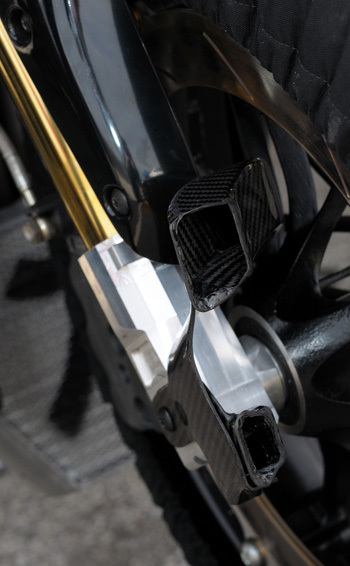 The carbon fiber ducts, similar to those used on NASCAR racers, helps drop pad temperatures more than 200 degrees Fahrenheit. 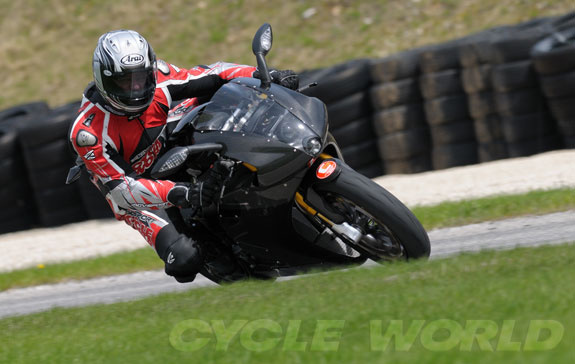 But for the rider, the big advantage is that brake feel is superb, light, powerful and controllable, with the possibility of dialing in a very precise amount of braking when the bike is leaned over. He wasn’t kidding. 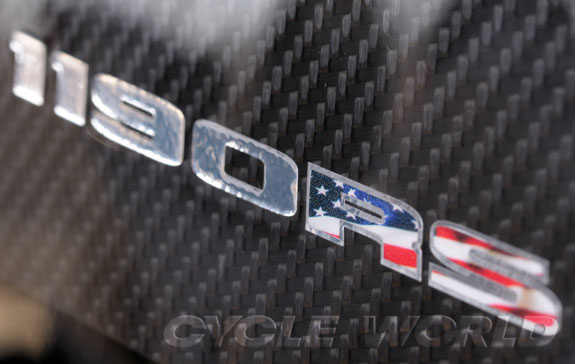 The completely stock EBR 1190RS, serial number 11—the first production version—in the Carbon-Fiber Edition, weighed just 384 pounds at the curb, full of everything except fuel. 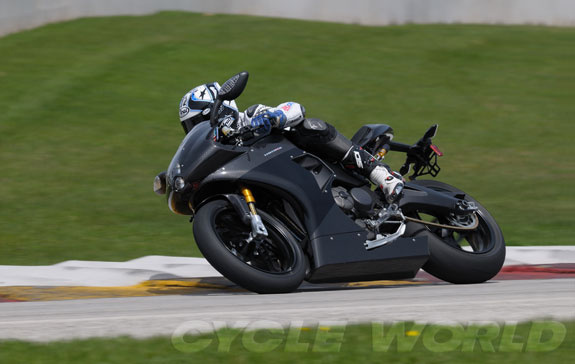 With the optional race muffler and race ECU, the way it appeared at Road America, it weighed just 369 pounds with a dry tank, or 397 pounds with fuel brimming. 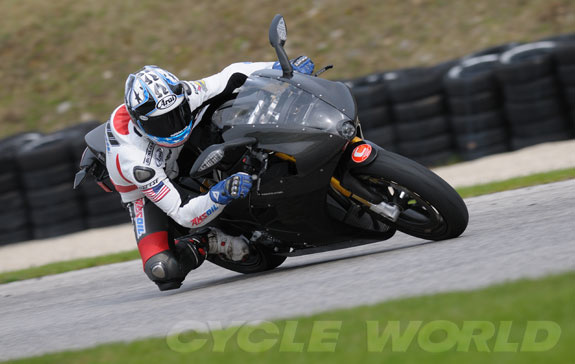 And it made as much or more power (175-plus horsepower) than the 1125cc bike May had been racing and placing in the top ten in AMA SuperBike and with which he even briefly led the 2010 Barber SuperBike race. 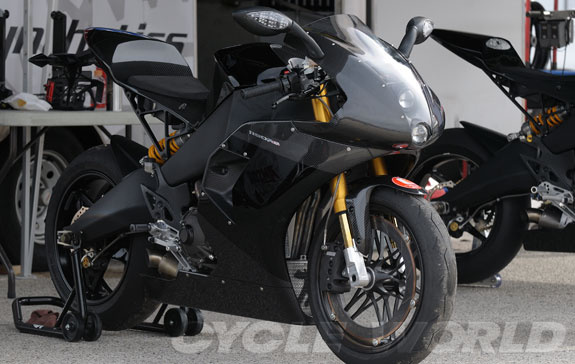 Meanwhile, the new skinny fairing offered a substantial aerodynamic improvement over more bulbous fairings from the Buell era. The equation was simple: similar power with more torque, similar weight as the pure racing bike and significantly better aerodynamics. 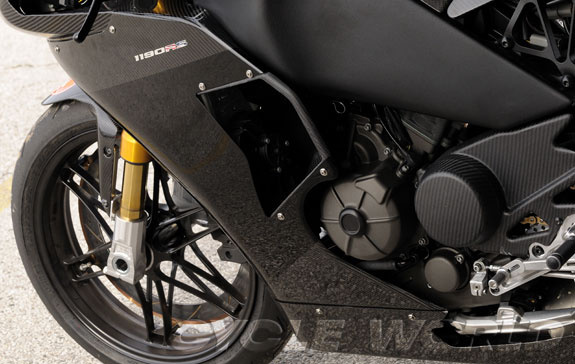 No wonder the 1190RS in Stage 1 trim (muffler, ECU) was literally faster than its pure racing predecessor. It certainly showed on the long Road America front straight. Coming out of the last corner and starting up the hill, the torquey V-Twin had a hard time keeping its front wheel on the ground, requiring me to feather the throttle to prevent a loop. 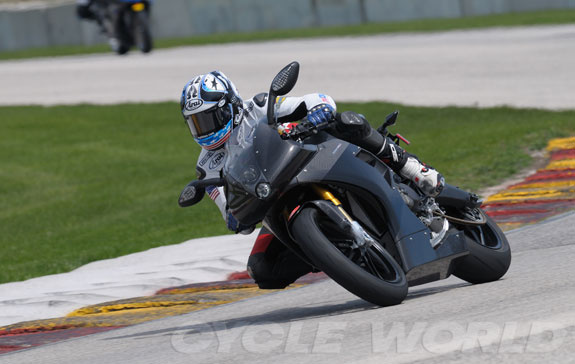 Even as it crested the hill in fourth gear at 140 mph, even while I pulled hard up against the airbox cover to move more weight forward, the front wheel elevated 6 inches before settling down. Top speed at the end of the front straight was pushing 170 mph, and I was braking early! But what was truly amazing was the character of the power. The 1190cc engine was created in East Troy by boring a Rotax 1125cc powerplant 3mm. The 106mm CP pistons are machined from aluminum billets in California and, with a thick base gasket under the cylinders, yield a 13.6:1 compression ratio. The rods are forged steel, and overall reciprocating weight is reduced, as is the crankshaft mass. The camshafts are identical to the 1125cc race cams but timed for less overlap so the bike can pass emissions tests. 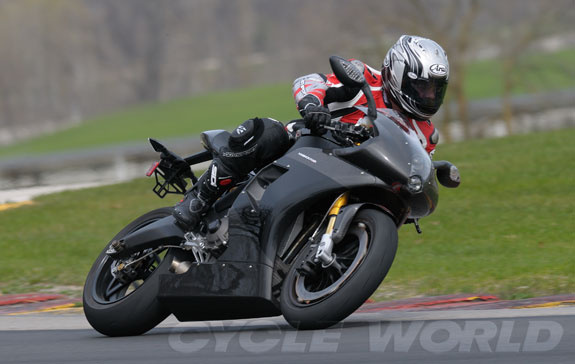 A Swiss Suter Racing slipper clutch is fitted, along with a compensated output sprocket for the 520 chain drive. 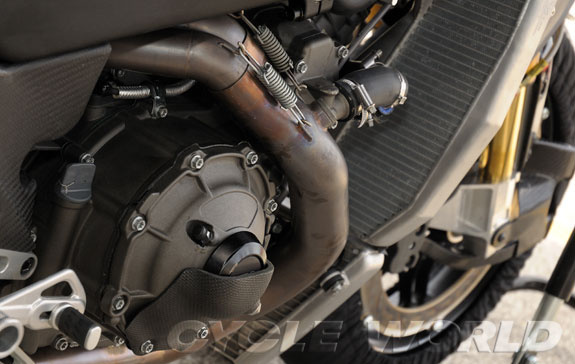 The engine breathes through a much-expanded airbox and larger ram-air system. Despite its state of tune, this Superbike hot-rod starts just like any other streetbike, even if the race muffler is loud. 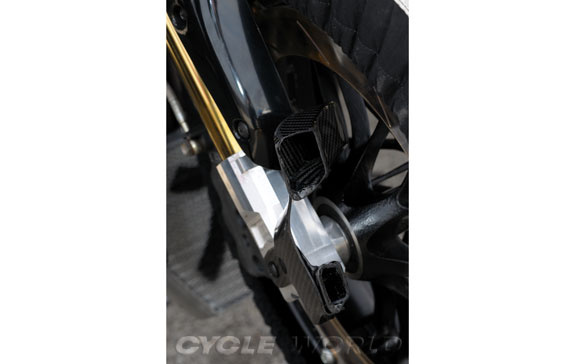 It settles into an easy idle and pulls smoothly from just above 3000 rpm in top gear. 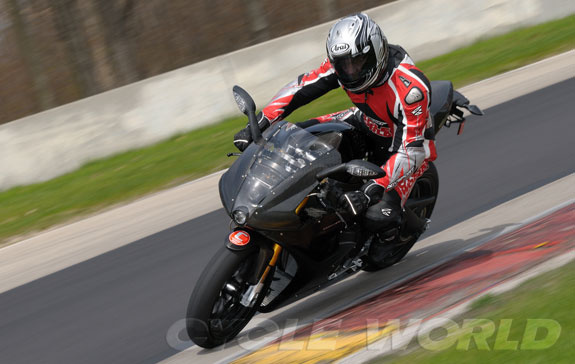 On the track, the operating range is amazingly broad, with plentiful torque for exiting corners from below 6000 rpm, followed by a top-end that pulls harder and harder through 11,000 on the way to an 11,500-rpm redline. It’s an engine that is almost the essence of V-Twin: tractable, torquey, a little lazy compared to the frenetic energy of a Four but with none of the liabilities of classic V-Twins. 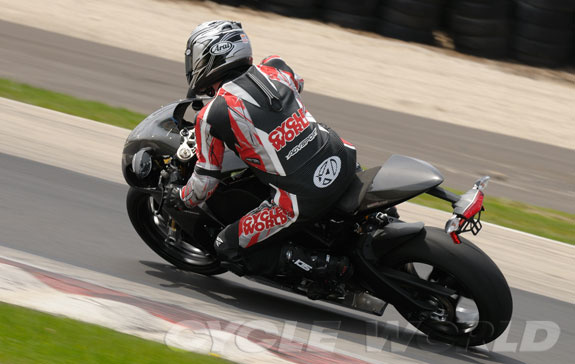 Braking hard from the back straight into tight Turn 5, I could just click down four gears, and between the slipper clutch and the ECU bleeding extra air through the Idle-Air-Control (IAC) system, there was no need to think about matching revs or worry about rear-wheel hop. 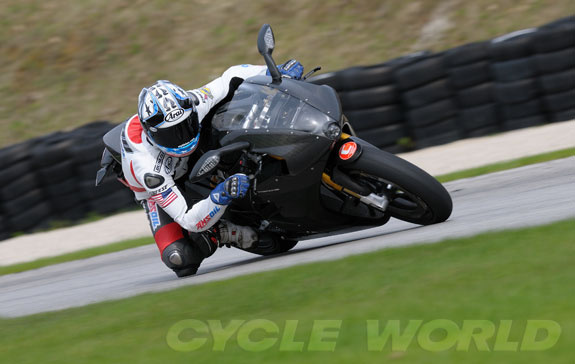 May says that the Suter is the best slipper clutch he has ever used, and that one of the big advantages of the 1125RR is that it can dive deeper into corners than the Yosh Suzuki he rode in 2009.